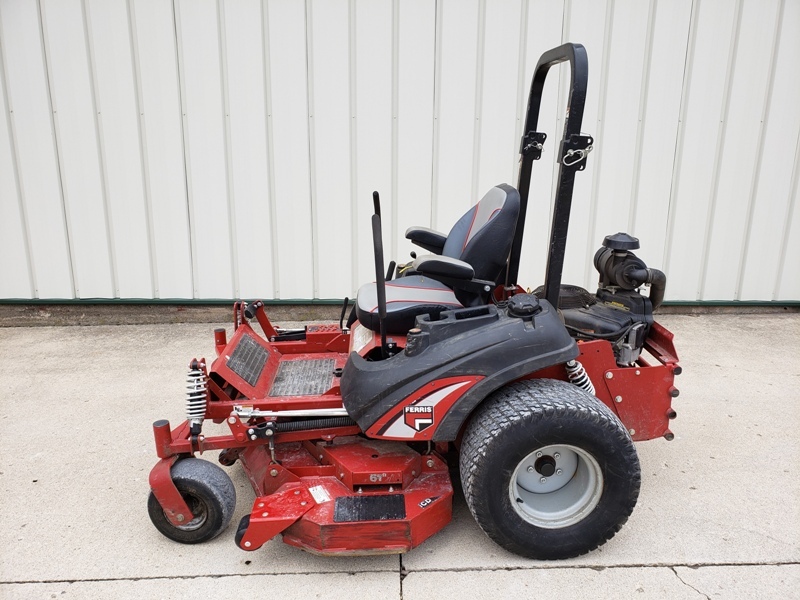 A beefy commercial zero turn mower redesigned from the ground up to out-spec the competition. You don't so much perform landscape work with the IS 3200Z as take a leisurely cruise while incidentally cutting the lawn. When our engineers set out to reimagine Ferris's already impressive IS 3100Z, they ratcheted up so many specs, the resulting lawn machine is rugged yet refined – a truly premium turf groomer. Ride means a great deal to any lawn care professional. Spending several hours in the saddle each day, you owe it to yourself to ask, "which zero turn has the best ride?" We respond with our patented suspension technology – full rear suspension and independent front suspension. Adjust the stiffness to your tastes or to compensate for an additional load such as a collection system accessory. The entire system responds to the most unforgiving terrain with refined control and incomparable steering accuracy, softening the jolts and lessening the stress on both man and machine. Ferris also updated the mounting and leveling of our iCD™ Cutting System. The free-floating deck hangs independently of the suspension system employing solid steel rods, which are stronger and easier to adjust. This design delivers unrivaled, smooth cutting performance, even over bumps and dips. Lawn professionals will discover they can keep the IS 3200Z moving at higher speeds longer, completing more jobs faster – without scalping the turf. Imagine the time you'll save cutting up to a 6-foot-wide path per pass. And now for this zero turn's impressive work attitude. Look over your engine options, and you'll quickly see Ferris doesn't compromise on power. Choose the 36-gross-horsepower* Vanguard™ V-Twin BIG BLOCK™ or the biggest motor to grace a lawn mower – the 37-gross-horsepower** Kawasaki® FX1000V DFI. Either way, don't worry. You'll have plenty of raw torque to spare for hauling a load of grass clippings across those vast acres. To reliably flex all that muscle, we've upgraded the IS 3200Z's drive train to include dual, independent commercial Hydro-Gear® ZT-5400 Powertrain® transaxles. It's our most heavy duty transmission ever, with better cooling, improved airflow and zero potential leak points under high pressure. Put simply, it obliterates the competition's pump and wheel motor setup. Downtime is never an option, and when you partner with the IS 3200Z, it never crosses your mind. Take your productivity to uncharted territory – and enjoy the ride. • iCD™ Cutting System with included professional lawn striper delivers maximum cutting performance and enhanced discharge through the generous deck opening. The IS 3200Z comes with your choice of 61" and 72" wide decks. • The commercial zero turn mower line equipped with adjustable front and rear suspension, delivering a refined ride and a more consistent cut at higher traveling speeds. • Protected by our 2+2 year limited warranty. Patented Suspension: Patented suspension system consists of adjustable rearcoil-over-shocks and front independent adjustable coil-over-shocks. Cutting Width (in. ): 61 in. Overall Width (in.) deflector down / deflector up (model): 76.75" / 66.5"
TURBO-Pro™ Max or FAST-Vac®Triple Bag Hard Top Collection System: Triple Bag Hard Top features and innovative molded hard top design that allows for increased capacity. Simple to install. Each heavy-duty mesh bag has an integrated handle to assist with removal. Capacity: 15 cubic feet. Fits 61" models. TURBO-Pro™ Max or FAST-Vac® EZ Dump™ Collection System: The EZ Dump™ increases productivity by giving the operator the ability to release clippings from their seat with the use of a toggle switch. The low profile of this system is better for visibility when compared to competitive systems. Capacity: 12.5 cubic feet. Fits 61" models only. TURBO-Pro™ Max or FAST-Vac® EZ Dump XL™ Collection System: The EZ Dump XL™ Collection System is ideal for larger jobs. Simply squeeze the handle and pull up to release the hopper right from your seat. The hopper is specially lined to ensure that all material is dumped each time, for increased productivity. Capacity: 14 cubic feet. Fits 61" models only. Suspension Seat: Suspension seat for optimal comfort. Power levels rated in accordance with SAEJ1940 at 3600 RPM. See dealer for warranty details. Refer to engine operator's manual for engine warranty.